Engines: power and economy | What Car? By far the most important engine will be the 2.0-litre turbodiesel in the 520d, now producing 184bhp and 281lb ft of torque. 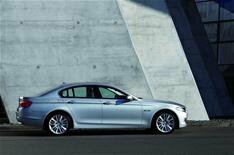 Thanks to BMW's Efficient Dynamics package which includes an engine stop-start system for the first time on a 5 Series, along with gearshift indicator lights, brake energy regeneration and low-friction tyres it's also more than 3mpg and 8g/km of CO2 more efficient than the previous model. A six-speed gearbox, active aerodynamics that close cooling flaps when they're not needed, widespread use of aluminium and electric power steering (another first for the 5 Series are further aids to economy. The only version without a six-speed 'box is the range-topping 550i, powered by BMW's 407bhp twin-turbo 4.4-litre V8. The 550i has an eight-speed automatic gearbox, with or without manual paddle-shifters, that's optional across the rest of the range. There are five other engines, all 3.0-litre six-cylinder units: a couple of turbodiesels (the 201bhp 525d and the 242bhp 530d) and three petrols, badged 523i (201bhp), 528i (254bhp) plus the twin-turbo 535i (302bhp). All are more fuel-efficient than their equivalents in the previous car.